/ Comet ISON in 2013: Nibiru Doomsday or Omen of Christ’s Return? When is a comet not just a comet, but a divine warning sign like Jesus spoke of coming in the end times? If you do not know how to answer that, Comet "ISON" may test you with fear and anxiety in 2013. Doomsday watchers are already predicting that Comet ISON is Planet X, Nibiru, Wormwood, or a gravitational earthquake/deep impact threat. Alternatively, some predict it will make a spectacular daytime visible sign in the sky one month before Christ’s return (yes, on Christmas, 2013). Is Comet ISON a good or bad sign, Nibiru, Wormwood or a fulfillment of some other Bible prophecy? Find out how to tell when a comet is just a comet and what must come before Wormwood and other things Jesus warned about come upon us. If you have not heard much about the odd-named Comet "ISON" yet, you may become quite sick of the updates on it before 2013 is out. Comet C/2012 S1 (ISON) could become one of only ten comets in history to be visible during the daytime due to its size and trajectory. It may even be as bright as the moon for a short time at its perihelion—or closest approach to the sun—on November 28, 2013 (Thanksgiving and oddly enough, Hanukkah). After that, if the sun does not rip it apart (like it did to Comet Elenin in 2011), then its orbit will bring it past the earth in January, 2014. Joel 2:30-31 — "And I will show wonders in the heavens and in the earth, blood, and fire, and pillars of smoke. The sun shall be turned into darkness, and the moon into blood, before the great and the terrible day of the LORD come." Luke 21:25-26 (HCSB) — 25 Then there will be signs in the sun, moon, and stars; and there will be anguish on the earth among nations bewildered by the roaring sea and waves. 26 People will faint from fear and expectation of the things that are coming on the world, because the celestial powers will be shaken. Rev 8:10-11 (ESV) — 10 The third angel blew his trumpet, and a great star fell from heaven, blazing like a torch, and it fell on a third of the rivers and on the springs of water. 11 The name of the star is Wormwood. A third of the waters became wormwood, and many people died from the water, because it had been made bitter. Mt 24:30 — Then the sign of the Son of Man will appear in heaven, and then all the tribes of the earth will mourn, and they will see the Son of Man coming on the clouds of heaven with power and great glory. Could this comet be the “sign” or “portent” of the glorious coming of the Messiah? This comet, if it lives up to its billing, certainly could point to the glorious soon coming of the Lord Jesus Christ from heaven! The comet may be fragmented by the sun as it whips a scant 1.1 million miles above its surface in November, 2013. A fragmented comet multiplies the number of threats and ads unpredictability. Doomers may have a field day speculating about this. 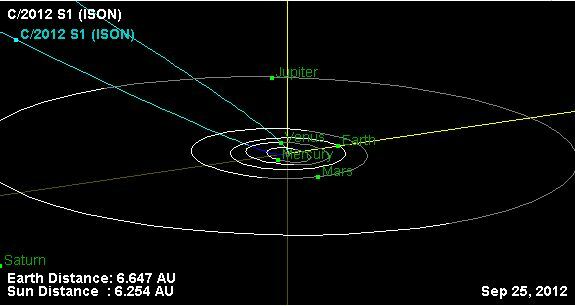 If it survives skimming the sun intact, Comet ISON's expected path will take it within 37 million miles of earth in January 2014. Anytime a comet gets even remotely close to earth, all kinds of outrageous claims about the threat of its gravity on earth are made (trigger volcanoes and earthquakes). Since earth is expected to pass through the tail of the comet on January 14-15, 2014, a meteor shower may result on those days. Get your gas masks now! You get the idea. We went through this just two years ago when Comet Elenin was passing. As expected, real scientists proved reliable then while the conspiracy theorists/pseudo-scientists making outrageous claims did not. This is something to keep in mind when you hear the claims about Comet ISON and any future comet. 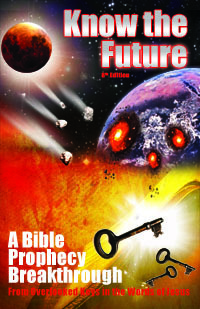 Warning Others From Bible Prophecy? Nevertheless, as the verses quoted above describe, one day there will be a global catastrophe caused by space objects and preceded by heavenly signs. Science already tells us that Comet ISON is not bringing doomsday this time, but how do we know for sure in this case that a comet is just a comet and not a doomsday warning from God? Thankfully, when you consider the Bible on this topic, the answer that emerges is very simple to comprehend and prove for yourself. What some Christians typically do when they read of events like Comet ISON, is they scour the Bible for anything that even remotely matches it. When they find something resembling the event, they go about warning others of what they have found. They figure it is "better to be safe than sorry" or sometimes they even consider themselves to be "watchmen" like Ezekiel (Eze 3:17; 33:2) obligated to warn people or face severe personal consequences with God. However, the Bible is too general, too open to interpretation and too ambiguous to deliver a clear warning and make people accountable to it as a real prophet like Ezekiel can do (Elijah, Two Witnesses, 144,000). All the division and confusion about how to interpret the Bible among even Spirit-lead believers should make that evident. That is why God spoke to Ezekiel with a clear, specific warning for him to deliver to a specific audience who would readily understand it. Ezekiel did not warn people "just in case" there was a threat or just in case God wanted him to. He heard the exact message straight from God and that he was appointed by God himself to warn people about it. In other words, if Comet ISON were a sign or judgment from God, a known established prophet (like Ezekiel was) would be sent to warn us clearly, in plenty of time ahead of time. We would not be left to be confusingly warned by the doubtful conclusions of fellow Bible students who don't even agree with each other. In contrast to what Bible students do, God's prophet would be sharing the word of God he received directly, with signs and wonders to authenticate that he was sent by God so we do not have to trust his mere opinion. You may be wondering what, then, are the Bible's prophecies for anyway, if not to warn us or to at least quote at each other? As Revelation 1:1-3 says, God gave us such revelation to show his servants what is going to happen in the end times and to "bless" us. But we should not mistake this "showing" with a true warning. Those prophecies were given over two thousand years ago to a general audience. They could not have been a warning to most readers as evidenced by the fact that they died long before the events spoken of ever happened. The prophecies instead help God's servants to understand God's plan and to discern the truth. For those of us alive when God sends a prophet to warn us that the prophecy of Wormwood is imminent, we can use them to see if what the prophet is saying is reliable or not, judging from whether it conforms to prior revelation of God (Acts 17:11=Isa 8:20). Aside from the fact that no prophet is here to authoritatively warn us about Wormwood, another reason Comet ISON cannot be Wormwood is that there are a few prerequisite milestones that precede Wormwood. Revelation 14 lays out a helpfully simple roadmap of three angel messages. First comes a message of repentance going out to the world (Rev 14:6-7). This precedes the fall of Babylon and the announcement of the same (Rev 14:8), which in turn precedes the announcement of the Great Tribulation/Mark of the Beast (Rev 14:9-11). Since Wormwood (6th seal - 4th trumpet) immediately precedes and sets the stage for the Great Tribulation (5th trumpet - 7th trumpet), Wormwood cannot come until the prophet of repentance with instructions on God's end time escape plan (Rev 12:14-16) comes first. Although Comet ISON cannot possibly be Wormwood (or any other prophesied end time threat) without a real prophet to certify this, I personally don't mind people saying it is. I have seen too many times how the spread of misinformation about Bible prophecy leads to people getting interested in the subject so they study it for themselves for the first time. (This includes myself when I was introduced to Planet X misinformation in 2002 which lead to my understanding of Wormwood). Speaking from personal experience and from the testimonies of many readers of my book, it's thrilling to understand the Wormwood prophecy now, ahead of time. It breaks open the book of Revelation which in turn greatly illuminates the rest of the Bible in a very satisfying way, even if it is not the final or authoritative warning of Wormwood yet. If you thought that the 2012 Mayan calendar debacle would silence doomsday "nutters" for a while, you may be disappointed. Only a year later Comet ISON is providing yet another set of tricky doomsday scenarios. Unlike the Mayan calendar apocalypse, these are based on a real celestial event, one that is historically considered ominous. This makes it harder to ignore or debunk than the Mayan calendar speculation was. Nevertheless, from what reputable scientific sources like NASA tell us, we can trust that Comet ISON poses no threat to earth. At its closest approach to earth, it will still be almost half the distance from the earth to the sun, a vast gulf. It will pass uneventfully into deep space, never to be seen again. This leaves no chance for it to be the fabled Nibiru/Planet X doomsday object. Further, from what the Bible tells us, we can also be sure that Comet ISON is not Wormwood or even a warning sign from God. God would already be warning us through his prophets ahead of time if this object was meant to mean something or was part of end time prophecy from which we needed protection.